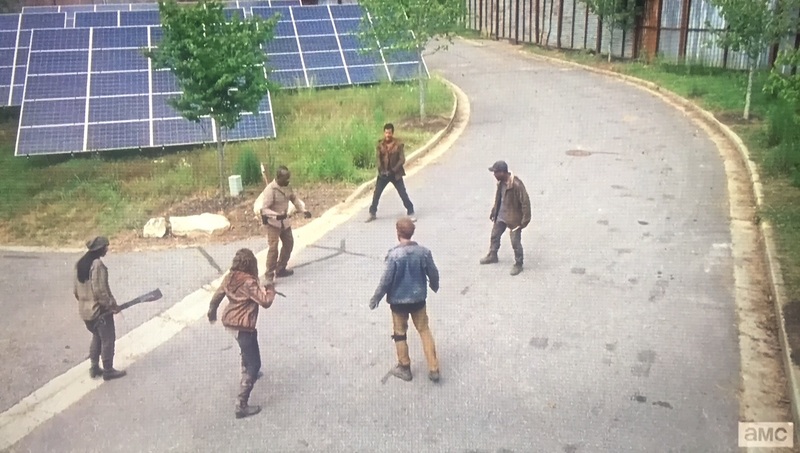 If I told you beforehand that the second episode of the season would see Rick, Daryl, Abraham, Michonne, Glenn and Sasha having exactly zero screen time, my guess is you might begin to have reservations about the quality of the episode and the direction of the season overall. This is where we are with JSS as Carol, Morgan and Carl among others are tasked with carrying the episode while faced with an invading force of utmost brutality. Carol’s cover is forced to be blown as Suzy-Homemaker morphs into undercover Wolf. She dispatches a handful of invaders before she meets up with Morgan. Then the philosophy of killing and the practicality of killing meet head on. Carol is no stranger to deciding to end someone’s life. She’s probably quicker with the trigger than even Rick. For her this was a no-brainer; the wolves were threatening the lives of her and everyone else, so they deserved to be killed indiscriminately. Morgan has adopted a view that all life is precious. 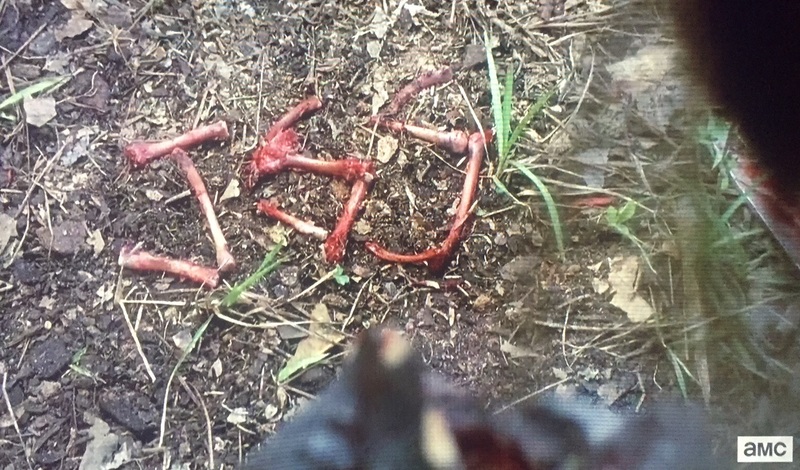 This is a view he sticks to regardless if that life is trying to kill him (recall his handling of the two wolves members in the final episode of season 5). When they meet up in protection of the town, Morgan is mid-battle with an ax-wielding wolf when Carol stabs and kills the invader. This happens again when, after Morgan and Gabriel tie up an attacker, Carol puts a bullet in his head the moment she arrives. It is here we get one of the more interesting interactions. 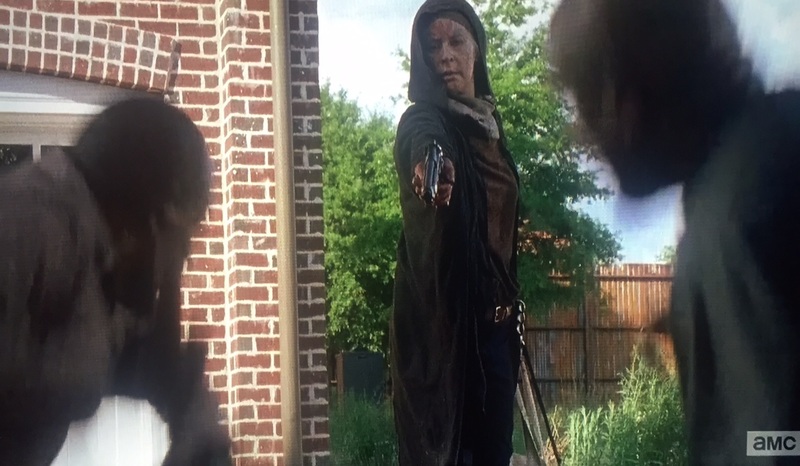 Carol hands a gun to both Morgan and Gabriel. Morgan, distraught over what he sees as Carol’s recklessness, passes his gun on to Gabriel. The preacher of the show now carries two handguns and appears at least willing to use them, while the pacifist continues with his staff. I would hope this exchange didn’t fall on passive eyes and ears for the audience. We’re seeing an explicit contrast between two philosophies on life wherein even a religious man striving for restoration would accept a situation in which he might take someone’s life. What are we to make of this? Is Morgan more compassionate and loving than even a minister of the gospel? I’ll skip a full-fledged breakdown here of a Christian stance on violence/killing (though I’ll be happy to entertain it in the comments). But suffice it to say killing, in this specific circumstance, would in no way be counter to a Christian worldview. What I’m more interested in is where the show went with Morgan’s pacifist stance. Even if one disagrees with his stance, you have to respect his devotion to it. But in a final skirmish, Morgan encounters the very wolf member that came upon him at his campfire at the end of season 5. Morgan gets the upper-hand on him and, it would appear, kills him. I think we saw a noticeable difference in Morgan’s temperament here. Rather than be guided by his principles and stance on killing, his anger consumed him. Whether it was the thought that this man followed him back to Alexandria, or the turmoil of his recent arguments with Carol, something had Morgan out of character. Or at least this most recent rendition of his character. He was overcome by emotion, and it cost him his principles. Time will tell if this was a moment of clarity helping him see the reality of the choices he must make, or if it was a moment of weakness and he remains staunch in his belief that killing is not necessary. The episode title comes from something Enid adopted; just survive somehow. I thought it strange to have this as the title for no more meaningful than she was in this episode. Although of course we can see the “somehow” in that playing out in Carol and Morgan’s respective approaches to dealing with danger. The opening with background on Enid wasn’t bad, but it wasn’t terribly interesting. The best pre-havoc portion was certainly Carol’s interaction with the other women in the food pantry. Exchanging recipes, sharing fond memories of cooking… calling out the presumed alpha for her smoking habit which could kill her. When it hit the fan and this woman was the first one killed, while smoking, it was poetic justice in an otherwise insanely brutal attack on the town. This episode was great and none of the big players were even present. I only have minor complaints on character choices but nothing even worth mentioning. Season 6 is going strong. 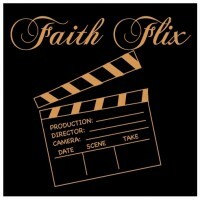 I would love to hear what you thought of this episode, and how the season has started! The whole JSS thing is more important than you give credit for I think. Enid is one of the W’s. She infiltrated Alexandria as a spy. When she is sitting back to back with Carl she almost spills the beans and he cuts her off not realizing what she was about to say. In the beginning of the episode you see her descent from humanity to beasthood under the order of “Just survive somehow” probably something her parents told her? Regardless, in the opening sequence, you see her move from scared girl who lost her parents, to girl who can kill a walker, to a girl willing to rip off the head of a turtle and eat it raw like a wolf. Her hesitation to enter Alexandria was about not being sure if she should commit to the task she was given to infiltrate that place, there is a little bit of humanity left in her. She left when the W’s retreated, she left with them. Thanks for the comment, Jacob! Missing you in the HoD man!. That’s a pretty popular theory among viewers, that Enid is a Wolf. I’ll have to go back and watch the scene you’re referring to where she almost spills the beans because I didn’t get that impression. And the killing the walker/eating the turtle is just a manifestation of her JSS mantra, not necessarily a result of becoming one of the Wolves. I suppose it’s a bit curious that she left when they did, but why would she just leave and not attach from the inside when the rest attack from the outside if she really was one of them? This is a really interesting theory, and I think it would be a cool twist, but I think the timeline disproves this theory. Enid was already there when Rick’s group got there. The Wolves didn’t know of Alexandria until they recovered Aaron’s map in his backpack that he lost on a scouting run with Daryl. That’s how they found the place. The only possibility I think it that when she was climbing the wall (Carl followed her once) she was reporting back to them and the photos are just a diversion for the viewer to think Aaron is to blame when it’s actually Enid. I dunno, seems somewhat far-fetched. BUT, like I said, it would be a cool twist. A lot of action, which made it tense and exciting. However, that’s basically all it was: Action. Nice review Gene. Ahhh c’mon man. You have two distinct philosophical views on killing butting heads in practicality. Sure it plays out in action, but it’s much deeper than that.